Angel cards provide truly comforting, compassionate guidance that helps you grow spiritually. The power of Angel cards lies in the fact that they see the positive lesson in every situation, including the situations that seem very negative. The wisdom of Angel cards comes from celestial beings such as our spirit guides or deceased loved ones. These beings see life from a higher place, so their messages convey deeper truths and real love – which is devoid of ego and petty obsessions. Who are the best Angel Card Readers? What to ask the Angel Cards? The Angel card deck is a 44-card deck that’s filled with wisdom, inspiration and higher guidance. Each card has an image and words that convey the message you – the client – need to hear. Each cards brings a different message, and the messages are meant to uplift, inspire, encourage, and enlighten. The cards can answer any question – from your life purpose to how to handle a coworker. Angel cards are designed to help with open-ended questions as they almost always show the bigger picture in any situation. 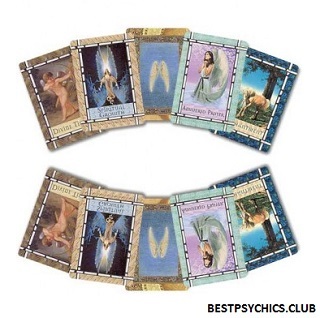 An angel card reading is a form of psychic and spiritual cartomancy (card reading). Like tarot cards, Angel cards are bundled in a deck and the reader shuffles them and then draws a card, or a set of cards, to answer your questions. The Angel cards are designed to channel angels’, celestial beings’, and our spirit guides’ wisdom, along with messages from our deceased loved ones. They bring divine love and understanding to any life situation, however difficult it may seem. Angel cards are known to be nonjudgmental, supportive and full of unconditional love. Whatever your questions are, you can trust that the cards will be the guru you’ve been seeking. They will give you answers that will feel so right, so empowering and so loving that you’ll leave the session ready for your next steps. Julianna Day – Consulting the angel cards is unlike consulting any other oracle. It is a mystical, magical experience. Together, we open a door to a beautiful garden where our angels await – just hoping for our visit! Their sole purpose is to guide us; lovingly walk beside us on our journey. It is their fervent prayer that we reach for their hand. Working with the angel cards does just that! Angel card readings show you your bigger picture. For example, if you want to know whether your coworker is spreading gossips behind your back, the cards will give you more than a simple yes/no. They will show you why you have attracted this person into your life – perhaps you have trust issues, or perhaps you need to be more discreet about your personal life. Or, perhaps your larger lesson is to have compassion for people who don’t have a life, and therefore talk about others’. So to get more out of your Angel Cards reading, ask open-ended “spiritual” questions. What am I to learn? How can I help my soul grow? Here are some tips that will help you get a really good reading. First, set a clear intention. What do you want out of your reading? Prepare questions, decide which life areas you want to explore in the reading. Make sure your reading won’t be interrupted by people calling or texting you. Give your reading the importance it deserves by allotting it ample time and space. It is also very important to find the right reader – not every reader is right for you. You must feel drawn to the person, and either have references, or the ability to get free minutes with them. Our directory of psychics, mediums, and other readers serves to help you choose a reader who offers free minutes. 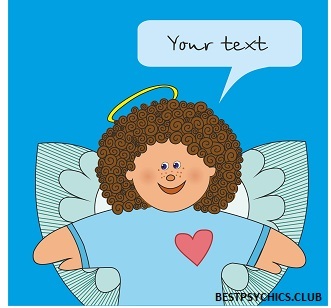 Talk to a high-ranked and highly regarded Angel card reader now. Need a one-on-one reading? Get it now! Remember, as a new customer, you have the opportunity to save up to 50% on your first reading. If you wish to have access to the angel cards all the time and anywhere, you can download the app absolutely free for your tablet or phone right way. For a number of people, angel cards are a remarkable way to start tuning the force of divination and to begin getting timely as well as direct knowledge from your angels. Whether you are new to the cards or a seasoned and experienced person, great spiritual benefits are associated with angel cards. 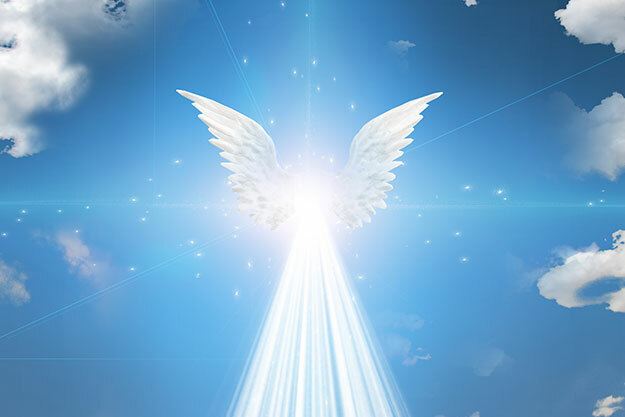 The free angel card reading widget is intended to assist you to instantly receive wisdom. You can use it on web, mobile and tablet. If you are like most people, you don’t get to talk to your spirit guides round the clock, frequently, or maybe not even … ever? It’s okay. Most of us don’t know how to use our extra-sensory perception to connect with higher realms. This is why a channeling tool such as Angel cards is so helpful. Focus on your question – it needs to be a clear question. Don’t change your question midway through. Focus on it with the intention of getting an answer. Not the answer you want to hear, but the truth. Intend to hear the truth. Be open. Let the cards bring you the guidance you need. Don’t wait, start your true spiritual journey today for self-improvement through angel card readings.